I've got a 1987 Made in Japan Strat with a System 1 tremolo. They were only made for 2 years and are pretty hard to find parts for. 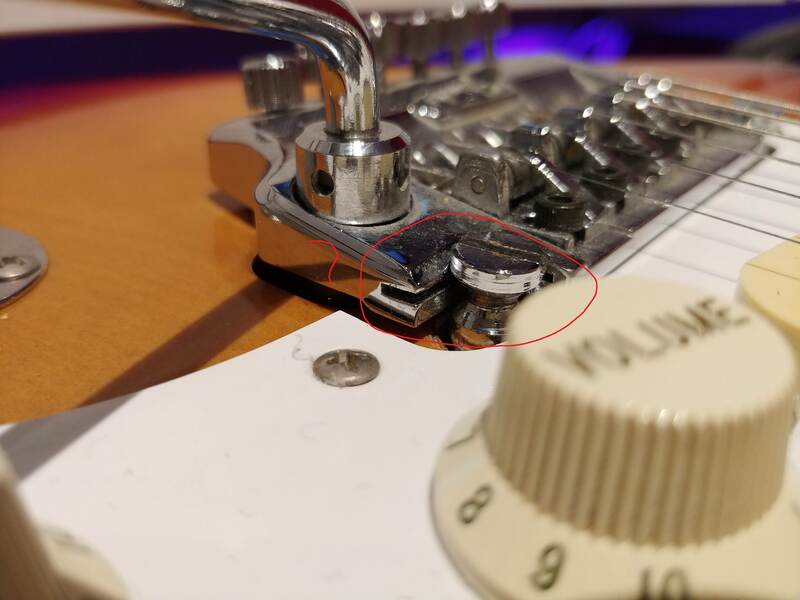 On the tremolo its self there are two screws which hold it down via two wings which insert into the body of the tremolo its self. I am missing one of these wings and was wondering if anyone knows where I might find myself one of these parts? Not talking about the bolt, sorry. Here you can see the wing is missing. It should be in that slot there as it is on the other side. This means the tremolo is too far forward and is resting on the pick guard. I was considering the exact same thing. Going to borrow some calipers from a friend to measure the wing thickness. Then i'll order some steel to make it from. Its not chromed or anything, just unpolished metal.